Cut beef steak into 4 serving pieces. 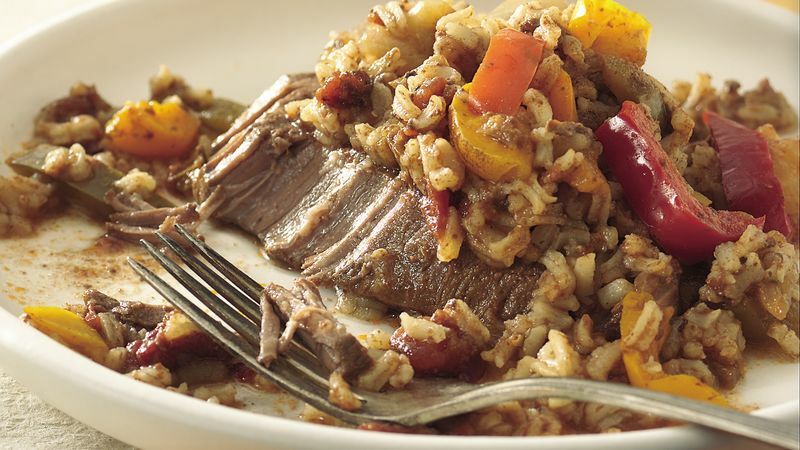 Place beef in 3- to 4-quart slow cooker. Mix broth, tomatoes, cumin, salt and garlic in medium bowl; pour over beef. Stir bell pepper mixture and rice into mixture in cooker. Increase heat setting to High. Cover and cook 20 to 30 minutes or until rice is tender. The moist heat of a slow cooker transforms inexpensive, less-tender cuts of meat into fork-tender dinner. Be sure to choose beef round, tip or chuck steak, or substitute beef stew meat, for this flavorful dish. You can quickly thaw frozen vegetables by microwaving on High for 1 to 2 minutes or placing them in a colander and running cool water over them. Or move frozen vegetables from the freezer to the refrigerator in the morning before you leave, and they’ll be thawed when you get home for dinner. Give this recipe a boost of fiber by using instant brown rice.